On this Stefano Rome Tours Shore Excursion into Tuscany from the port of Livorno, you will have the opportunity to visit two of Tuscany’s most famous cities that are rich in history, culture, charm and architecture: Pisa and Lucca. Pick up time by your ship in Livorno: 8 AM. Your English speaking driver will meet you on the pier next to your ship holding a sign with your name. Then you are off on your Tuscany adventure! Your Pisa and Lucca Shore Excursion starts with a relaxing scenic drive through Tuscany to your first destination, Pisa. There is more to Pisa than just the iconic “Leaning Tower of Pisa” known as one of Italy’s most famous sites and top tourist attractions, Pisa itself is a city with history rooted into ancient times and shrouded in legends. Romans themselves referred to Pisa as being ancient, and legends speak of the mythical king of Pylos following the fall of Troy. 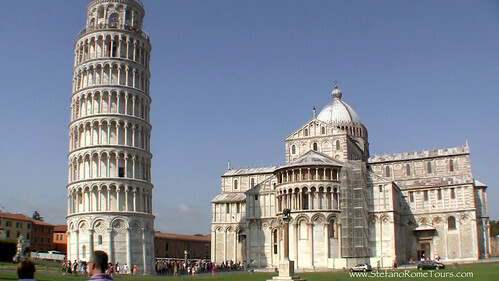 In more modern times, Pisa was a dominating commercial center that rivaled the formidable cities of Venice and Genoa. The commercial boom helped create the Pisan-Romanesque architecture that continue to inspire the locals and visitors alike. The famous place to visit in Pisa is Piazza dei Miracoli (Square of the Miracles) where you will see architectural beauty of the iconic Leaning Tower of Pisa, the Cathedral, and the Baptistery. These imposing religious monuments are recognized not only as among the leading centers for medieval art, but also listed as a UNESCO Heritage Site in 1987. The Leaning Tower of Pisa is one of the most popular photo opportunity sites as thousands of people pose for photos propping up the leaning tower of Pisa. Have fun, and don’t forget to bring your own camera and be creative on your photo shoot! From Pisa your excursion will continue with a leisurely drive through the splendid countryside of Tuscany to Lucca, a charming medieval town with Romanesque style palaces (palazzi in Italian) and churches, ancient Roman monuments, and unforgettable piazzas. As with many Italian towns, Lucca boasts a rich history dating as far back to the pre-Roman civilization known as the Etruscans who settled here thousands of years ago. The influence of Ancient Rome on Lucca is evident the moment you set foot in the famous Piazza dell’ Anfieatro, the elliptical square that took on the outline of the 2nd century AD Roman amphitheater that once stood here. Remnants of the ancient structure is still visible in the stones that peek out from medieval buildings that were incorporated into the ancient ruins. 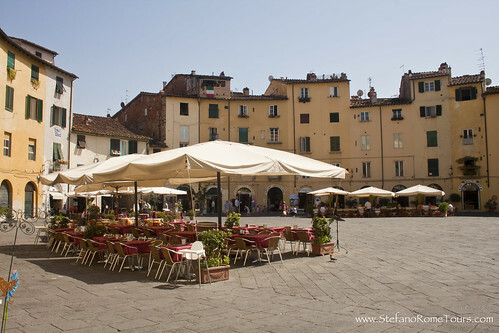 This lively piazza popular among locals of Lucca is surrounded by open air cafes, shops and boutiques. The flat narrow lanes conceptualized during the medieval times are lined with shops of all varieties making for a splendid stroll to shop, admire medieval buildings and beautiful Renaissance architecture, and take in the local atmosphere that makes Lucca so enchanting. Lunch is delicious at any restaurant in Lucca, as Tuscans take huge pride in their culinary mastery. You will be delighted to see that the major form of transportation within the town of Lucca are bicycles, thanks to the flat terrain upon which Lucca was founded. From Lucca you will enjoy a relaxing drive back to your ship in Livorno. IMPORTANT: Please check your email spam folder if you do not receive correspondence from us within 24 hours, and get in touch with us immediately. Special attention to hotmail and aol email accounts that often send legitimate email correspondence to the spam folder. * This Pisa and Lucca Shore Excursion Price includes English speaking Driver, private vehicle, all Italy Taxes, Fuel, Toll fees, and all necessary road expenses necessary to provide this service. * This Pisa and Lucca Shore Excursion Price does not include entrance fees to paid museums or monuments, lunch, gratuities, licensed tour guides hired separately, or any other personal guest expenses. * The Total Price for the shore excursion is per vehicle not per person. Guests may share the cost of the tour among themselves. * Your driver can make suggestions for lunch, but if you have a preference please discuss with your driver first so he or she can make recommendations. * This tour provides an English speaking Driver who is not a licensed tour guide. Italian laws aimed to protect the integrity of licensed tour guides, permit only Licensed Tour Guides to accompany guests away from the vehicle to sightsee. Your driver will be obligated to remain with the vehicle while you are sightseeing. * Save a lot on this Shore Excursion by sharing your tour with like minded fellow cruisers for up to 8 guests per minivan. It’s quite simple: all you need to do is place an ad on Cruise Critic’s roll call with a link to this tour page, and invite other cruisers to join you. * Payment for the tour to be made in Euro currency at the end of your journey, and paid directly to your Driver. You may also pre-pay the tour price in full via PayPal. Just let us know when your tour is confirmed if you wish to prepay. Don’t worry, we never ask for your credit card information to reserve your tours, nor do we penalize you with cancellation fees. We operate on the traditional Honor System, therefore we simply ask that all cancellations be made at least 7 days in advance so we can rebook your service and your reserved driver does not lose work for that day. Cancellations must be made via email and confirmed by us so we have it on record. We do not accept cancellations by telephone, text message or 3rd party. We greatly appreciate your cooperation and consideration. Please visit our FAQ page for more important information. * Please wear comfortable shoes and clothing during this and any tours.